Most dentists know at least one former colleague, classmate, or associate who took the plunge into becoming the owner of his or her own small group dental practice. If you look around and see your peers running their own small group practice, have you ever wondered how they made the transition and how you could as well? Owning and running a group practice enables you to maintain total control over all business and clinical decisions, while also benefiting from scaling out your practice from one centralized operations center. Owning multiple practices, however, does come with some inherent risk, so understanding how to maximize production, eliminate unnecessary costs, and streamline operations becomes paramount to enjoying lasting success. At Practice Analytics, we understand what it takes to successfully run multiple dental practices. That’s why our dental practice management software is designed to help multi-practice owners increase profits and productivity by aggregating data from individual offices into a holistic view of the business as a whole. Of course, state-of-the-art dental practice management software works better when supported by a strong organizational structure. Take a poll of most successful group practice owners and you’ll find that they all broadly followed four steps that enabled them to set a solid foundation for their business to flourish. If you’re thinking about starting your own group dental practice, or have just launched your new empire and need a few tips, here are a few central points to keep in mind when becoming a multi-practice owner. Creating a vision or mission statement for your practices can serve as the foundation for a successful business plan. Your plan needs to cover a variety of basics that include management, marketing, strategy, expansion, and succession. Not only will your business plan be used to help secure financing for your practice, it will also help to guide your practice development over the first three to five years. As you develop your plan, take the time to improve your understanding of the minutiae that defines running a successful practice. Knowing corporate structures, current tax and labor laws, and financial terminology suddenly become increasingly important when making the transition from associate to owner. The development stage is also the time you can work on improving your public speaking skills and confidence as an emerging CEO. Unless you plan on purchasing an already existing group practice, you need to plan out your expansion strategy as you transition from owning none or one practice to a group. Use key factors, such as population growth rates and socioeconomic status, to evaluate potential expansion sites to determine which areas offer the greatest opportunity for success. Develop a system for implementing a centralized administrative system that will help to oversee the day-to-day operation of all your practices. Brainstorm on how you can lay out your practices to improve productivity, use technology to connect each office, and hire the right personal needed to operate and manage each location. This is where dental practice management software can make an enormous difference in how you coordinate and operate your small group practice. To successfully run multiple practices, you need a system that allows you to accurately measure each practice both individually, and as part of an organization as a whole. At Practice Analytics, our online dental practice management software tools streamline the information from each practice to find data that can enable multi-practice owners to better manage all of their locations at once. Develop your understanding of nonclinical positions, when you need to add to support and administrative staff, and how to recruit, hire, and keep the right people for each job. You also need to work on improving your own leadership skills, while finding successful strategies for instilling leadership in others within your practice. Becoming a successful manager takes more than just being able to inspire your workforce. You also need to gain a complex understanding of state and federal labor laws so you can mitigate risk by staying in compliance. This will enable you to implement policies and procedures to reward team success while still protecting your assets and minimizing HR risks. Owning multiple practices enables you to spread out your overhead costs across a larger production base. Using a lean management philosophy, you can reduce inefficiencies and waste as you continue to expand your total production. There’s no reason to employ multiple people to do the job that one person can handle with the right support. 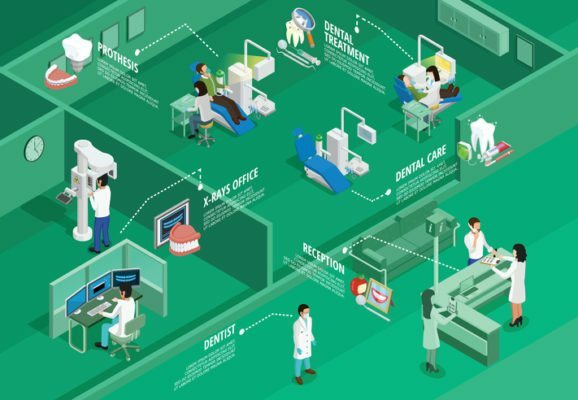 This is where investing in technology over people can have an enormous impact on keeping your practices lean, while boosting your bottom line. With the use of the right dental practice management software, you will find areas of redundancy that you can trim to form a leaner machine as a whole. Owning multiple dental practices offers both risk and reward. But with careful and diligent planning, the right people, and the right dental practice management software, you can build a foundation of success that will leave you with a thriving business.